Several friends and acquaintances have asked me about a certain matter which appears to have returned with a vengeance. It’s to do with Italian law and that impressive phrase ‘la legge è uguale per tutti’ which may be read in any Italian court room. The law may be equal (i.e. the same) for everyone but the verdicts that a judge may issue are not the same that one usually encounters in an English court of law. This is largely due to the fact that English law is based on Common Law and largely refers to previous cases for clarification of outcomes in trials or formulates new cases based on the judge’s decisions. 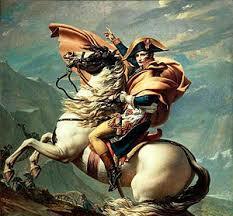 Italian law is based on Roman, or codified, law and is also influenced by the ‘Code Napoleon’. In 1990, however, the inquisitorial show-the-instruments method was replaced by the accusatory system more usual in those countries using Common Law. 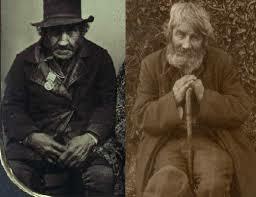 In England one can be found either guilty or not guilty. In Scottish law there is a third option ‘not proven’ which means that the judge may think that defendant could be guilty of the offence but has no firm evidence to charge him for it. This is an old option and many judicial people in Scotland prefer not to use it since a taint of guiltiness may rest on the acquitted one even if he has not been accused of any crime. The following are the only verdicts that a Judge can pass at the end of a trial. 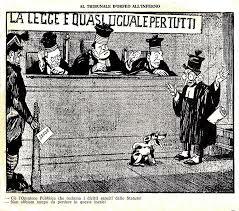 Perché l’imputato non è punibile Because the defendant is not liable for his crime, because he was insane at the time. I hope this explains a very important difference between English and Italian law if you ever get caught up in a penal procedure. Now, in the case of a civil one…. The Villa Reale in the comune of Marlia is one of the grandest of aristocratic villas built by the Luccan nobility for their use both as a summer residence and also as a place to grow crops, especially vines. The Olivieri and Orsetti family then came into possession of the villa and refashioned it, adding a splendid baroque garden, parts of which still remain to this day. 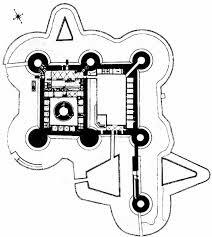 They also built the Palazzina dell’Orologio to house the villa’s servicing department. Big changes occurred when Napoleon’s sister, Elisa bought the villa from the Orsetti who were, in fact, rather unwilling to sell the place. Elisa paid the princely sum of 700,000 French francs which today (roughly) would equate to around 7 million pounds. It was Elisa who gave the name “Reale” (royal) to the villa. She enlarged the villa at a cost of another few million euros, ordering the architects Lazzarini and Bienaimè to transform it into the neo-classical building one sees today, and completely re-drew the grounds into an English garden layout with large lawns à la Capability Brown. In the course of this re-structuring many features of the previous baroque garden were swept away to be replaced by trees and bushes transplanted from the royal palace of Caserta (Naples) where one of the first English landscape gardens was laid out. It must have been fantastic to be present at the grand soirées held by Elisa in the villa’s new ballroom. Among artistes invited was the great violin virtuoso Paganini who became the princess’s music teacher and, perhaps, a little more. 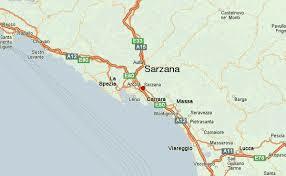 Elisa had quite a few lovers including the chief of her armed forces, Bartolomeo Cenami. When Napoleon was (regrettably, in my opinion) defeated at Waterloo, just two hundred years ago, British forces under the command of Lord Bentick chased poor Elisa out of her former domain although she was pregnant for the ninth time. Sadly forgotten and in somewhat straightened circumstances Elisa died in Trieste in 1820, one year before her brother, aged just 42. (It’s significant that, for a short time, Lucca was part of the British Empire since it was occupied by Bentinck’s troops). The villa passed to the Bourbons and Maria Luisa. The great architect Nottolini (he of the chain bridge at Fornoli near Bagni di Lucca) added a Viennese-style coffee house and an astronomical observatory. 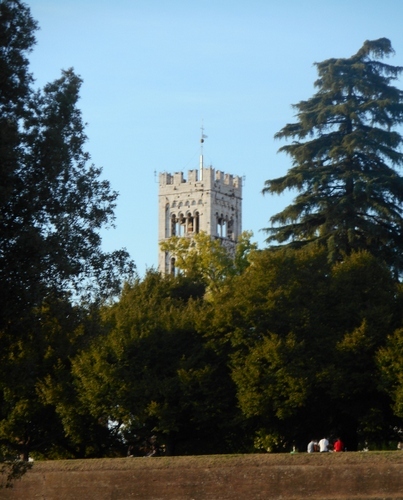 In 1928 the villa was bought by the Pecci-Blunt family in whose hands it remained until 2015.
Who owns it now? When the Villa Reale was put up for sale there was speculation of the usual sort. Would the Russian magnate buy it or the Arab sheik? Neither, in fact. It was sold to a swiss couple who intend to convert it into one of Italy’s first super-luxury hotels. No doubt we’ll now see the likes of the Beckhams and Clooneys parading through the villa’s grounds. But will we be able to visit it? I’m quite sure we will continue to admire the Villa’s magnificent gardens, some of the best in the Lucca and indeed, Tuscan area. The villa itself was never on the visiting list although, no doubt, it may be open for wedding receptions and the like. The gardens are full of scenic features including fishponds, a Verzura (green hedge) theatre, grottoes, statues and are a joy to visit at most seasons. Rather than describe their features I’ll just show a few photographs from the time we first visited their magic ambience in September 2005. Can it really be that long ago that we first visited the Villa Reale? 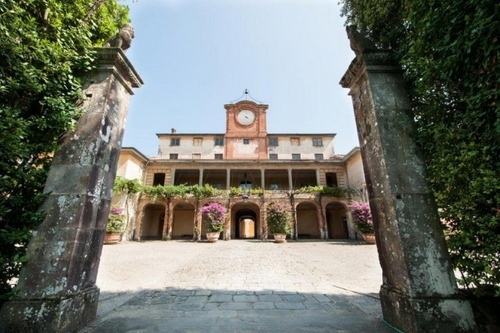 You might even be able to find out how much the villa Reale was sold for! 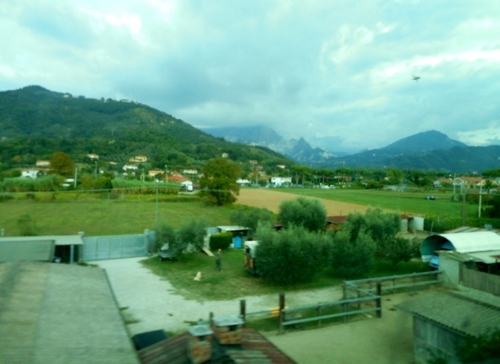 If anyone thinks that the villages surrounding Bagni di Lucca were inhabited by what Gray, in his immortal elegy on a country churchyard, referred to as mute inglorious Miltons, then think again. 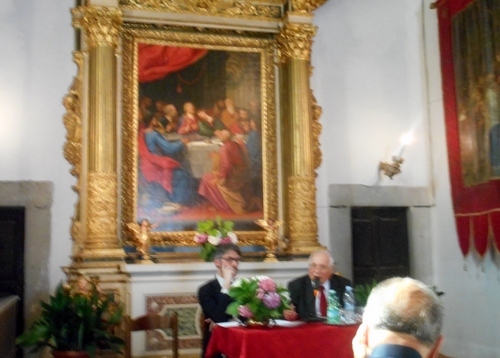 A series of conferences, started in 2010 under the aegis of the Fondazione Michel Montaigne and its director Marcello Cherubini (whose own father was a distinguished historian of the comune of Bagni di Lucca), continues to reveal the number of inhabitants who made a highly significant impact on the international scene, especially in art, literature and music. 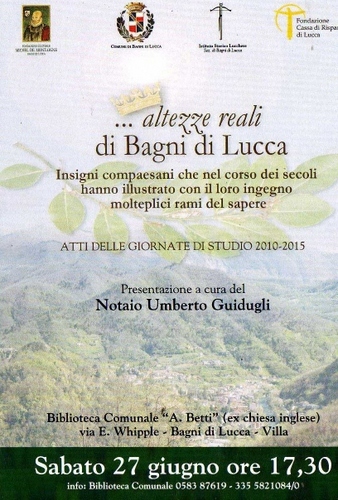 The results of these study days will be presented next Saturday 27th June at 5.30 pm in Bagni di di Lucca’s library, otherwise known as the ex-Anglican church. Here are two exquisite statues of the annunciation by Jacobo della Quercia’s dad, which date back to the 1300’s. 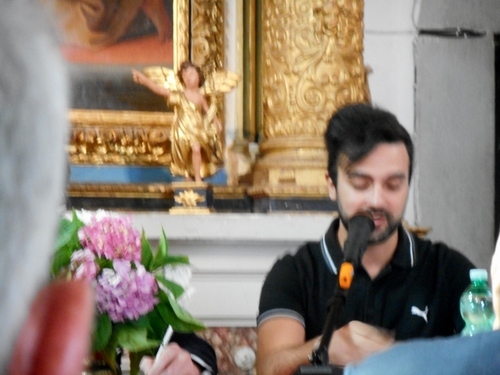 The conference was held in the very beautiful oratorio of the SS Sacramento, which dates back to the XVII century and has still part of its ceiling encased by a “cassettone” above the precious altar. 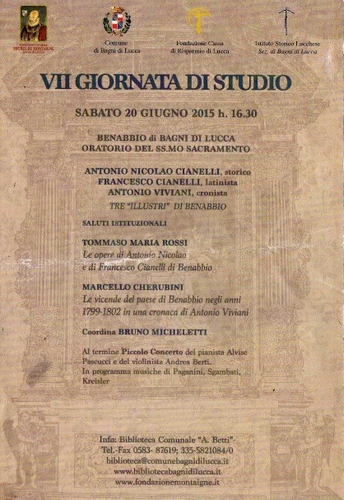 Benabbio has produced at least five important historical figures of which three were the subject of the conference. The conference was introduced by mayor Massimo Betti and coordinated by Bruno Micheletti. Antonio Nicolao (1753-1827 or 1830) was a historian and chronicler who produced Lucca’s first major history in several volumes, the last of which remains incomplete but which was to deal with the buildings of Lucca itself, including churches and palaces. The speaker, Tommaso Maria Rossi, is archivist of the diocesan archive of Lucca cathedral and was able to discover many new details, not the least of which is that we are not exactly sure when the great man died, 1827 or 1830. It would be good to get a reprint of Nicolao’s work as it is difficult to find and what he wrote sounds fascinating. It’s significant that Nicolao became a regular cleric of the order of the Mother of God which was originally in the monastery of the church of Santa Maria Corteorlandini, the church Luccans popularly call Santa Maria Nera to distinguish it from Santa Maria Bianca , Santa Maria Forisportam. The order placed great emphasis on learning and, indeed, the Lucca state archives and public library are housed in the former monastery. Francesco Cianelli 1838-1910 was Antonio’s nephew and he too, was ordained as a priest. Francesco became a classics scholar and teacher at Lucca’ seminary and was the author of various epigram and inscription published together towards the end of the nineteenth century. He was also one of the great poet, Giovanni Pascoli’s, Latin mentor and friend. In fact, Pascoli refers to Cianelli with great esteem and affection. 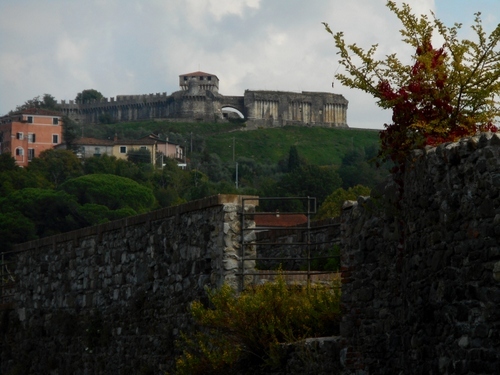 Pascoli should know for he managed to buy his lovely house at Castelvecchio Pascoli with the prize money obtained by winning various international Latin verse writing competitions! Incidentally, Francesco Cianelli is buried in the local cemetery. Clearly, he is not one of the mute inglorious ones inhumed there. 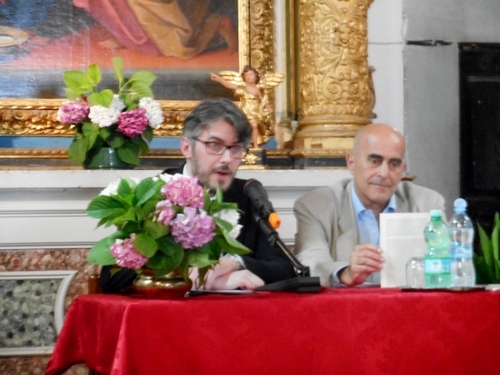 Marcello Cherubini gave his talk on Antonio Viviani 1770-1830, a poet to both the Pontifical and Neapolitan courts who wrote various dramas, poems and tragedies in a neo-classical style, with reference to Viviani’ chronicle of events in the area between 1799 and 1802. Both papers were not only interesting but fun too, especially Viviani’s account of what happened to the area during those momentous years 1799-1802, i.e. between Napoleon’s invasion of Italy and the peace of Amiens. The antagonism between the republicans and their tree of liberty, erected in Benabbio’s main square, and the religionist who opposed them chopping down the infamous tree and replacing it with a cross, only to have Lucca turned into a Napoleonic principality in 1802 with the arrival of Bonaparte’s sister, Elisa Baciocchi, gave rise to the closest the area had to an insurrection until that is, of course, the years 1944-5 with the battles between the partisans and the Nazi occupiers. I would also add that Benabbio continues to host significant persons. Some of them have their ancestry there. Thecla Reuten, for example, the Dutch actress born in 1975 has a mum born in Benabbio and often returns to the village. And of course the great English painter Raymond Victor Mee (1945-2006) and his wife Julia Mee, also a highly regarded artist, fell in love with this almost hidden village which inspired their work as Tahiti inspired Gauguin and Barga, Bellamy. However, it’s slightly disappointing that I have been unable to find details of any famous cultural contributions some other villages, like Longoio, have made to the world. 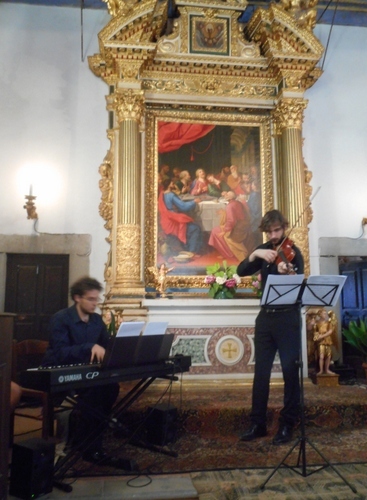 The conference was concluded by a short concert of music by Kreisler, Beethoven, Paganini (who was Elisa’s music teacher and lover) and Sgambati (who spent his summers in Benabbio) played by Carlo-Andrea Berti (violin) and Alvise Pascucci (keyboard). So yesterday, two hundred years ago, the battle was lost and won. I’ve only known one person who’s visited Saint Helena and described to me the remoteness and bleakness of the place. 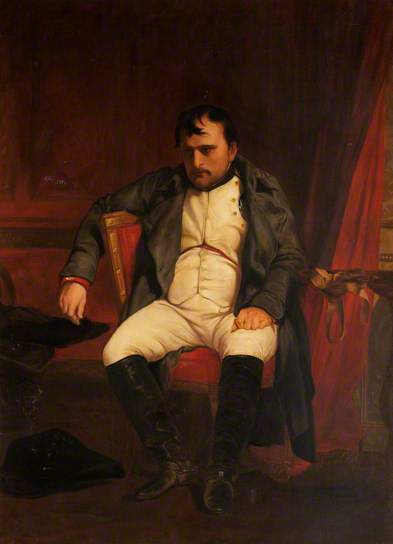 Better, however, than the end prescribed by Prussian Blucher: put him against the wall and shoot him without trial…..
There’s a poignant portrait of the dejected emperor getting ready to leave for the island and thinking about a continent he kept in suspense, war, anticipation and, ultimately, in relief, in, of all places, Welshpool town hall, which we know well, having been residents of the area for many years. What a terrible difference from that heroic stance just a few years previously as he crossed the Alps to create a new Italy? 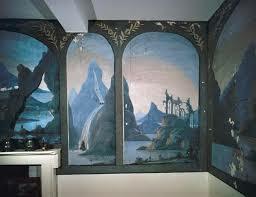 Still remaining in Wales there’s a room above the chemists at Llanfyllin with thirteen picturesque landscapes frescoes painted by Napoleonic POWs billeted in the town from 1812 to 1814. One of these officers, Lt Pierre Augeraud, fell in love with Mary Williams, the rector’s daughter. Her father disapproved of the engagement and had him sent back to France. In 1813 the rector died and, after Waterloo, Augeraud returned to Llanfyllin to marry his Welsh love. Love and war, war and peace! “Well, Prince, so Genoa and Lucca are now just family estates of the Buonapartes”. 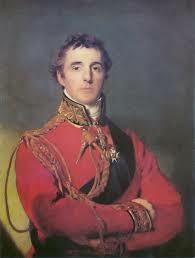 What would have been the effect on Lucca of what Wellington termed a “”close run thing”, if the iron duke had lost the battle of Waterloo? First of all, there would have been the completion of the porticoed via Elisa, whose gate has been so beautifully restored recently, straight into Lucca’ largest piazza still known as piazza Napoleonic or also piazza Grande. Second, there would have been further processional avenues “regularizing”” Lucca’s old town and turning it into a more easily accessible place with a distinct neo-classical feel about it. Already two churches and several houses had been demolished by order of Elisa, Napoleon’s sister, to create the piazza Napoleone, where pop icons will again perform this year during Lucca’s summer festival. Have you booked your ticket for Elton John, Bob Dylan or even Robbie Williams yet? Certainly we wouldn’t see the face of bourbon family successor to Elisa, Marialuisa on the statue in Lucca’s biggest square which was originally destined for Napoleon’s sister, Elisa Baciocchi! For Lucca was the jewel in the crown of Napoleon’s gifts of princedoms and grand-duchies to the members of his extended family and he wanted to give his favourite sister the best of them all, Lucca. 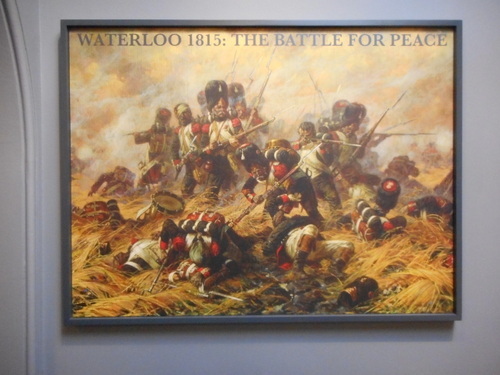 What did Wellington’ victory on the field of Waterloo mean anyway? The end of twenty years warring in Europe? The final defeat of France as the supreme European power? A future of forty years relative peace to Europe? Constitution, or Wellington arch, near the duke’ residence, Apsley House, in London had an intriguing exhibition on the battle which changed the face of Europe for the next hundred years when we visited it last week. It’s well worth seeing. Climbing to the top of the arch balconies give magnificent views over London’s parkland and beyond. 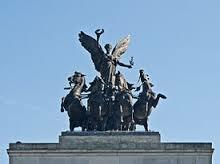 Crowning the arch is the world’s greatest bronze sculpture by Adrian Jones, Nike the winged goddess of victory descending upon the chariot of war. It’s a truly wondrous piece of casting, pure and in itself is a victory over France whose own Arc de Triomph has nothing to crown its empty top. Ironically, however, Jones’ statue was only placed at the top of the arch in 1912, just two years before the start of a mass slaughter which made Waterloo seem just a trickle of blood. For us Constitution arch is also our most romantic spot in London. After our registrar wedding in Caxton hall my newly appointed father-in-law took our first wedding photos against the backcloth of London’s most wondrous triumphal arch. Will the French ever let us forget Waterloo? Happily, daguerreotypes from the later part of the nineteenth century show old soldiers from opposing sides fraternizing with each other. There is hope. And we too have continued to join our love together like that arch. 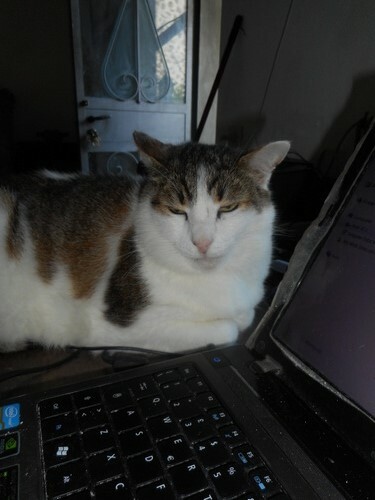 And our cat Napoleone surely agrees with us purrfectly! Yesterday’s weather in London was so glorious that walking was the order of the day with the. minimum of time to be spent indoors. A fresh wind did, however, challenge one sometimes but it kept the sky beautifully clear. London parks are, of course, world famous, most of all, for their presence next to busy urban and shopping centres. It’s possible to walk for miles through lovely greenery in London and mayor Boris has even laid on cycle routes on some of these. Using a hired Boris bike one can spin around paying just 2 pounds for a 30 minute ride from one docking place to another. Towards the end of my walk yesterday I found myself at one of the metropolis’ busiest traffic intersections withints one of its largest roundabouts. No problem, peace was just a few minutes away in a lovely rose garden just beyond Decimus Burton’s elegant regency screen to the park. One of the old keeper’s huts at the end of the screen provided a pleasant caffe area. Even the anti-hunt lobby must thank king Henry VIII for making this vast area into his favourite hunting ground for that is the origin of so many of London’s royal parks, including Greenwich. The only sign of hunting today, however, were the commuters and tourists seeking out the many varieties of roses in a beautiful garden only opened in 1994. Pergolas and rond points add to the charm of this exquisite spot and there are two very Italian statues enlivening the truly spectacular varieties of this queen of flowers. Of course, there are are other more grandiose displays of roses in London – Queen Mary’s gardens in the Regent’s park come to mind – but I truly loved the intimacy of this, yet another discovery for me in a city I thought I knew so well as one born and bred in it. The garden was just one sight visited in yesterday’s blue, bracing day. Across the park screen was the house known as no.1 London and still home to the descendants of the iron duke, famous for his.boots and for defeating Lucca’s most famous princess, Elisa Baciocchi’s brother at a place named after a London railway terminal (or was it the other way round?). No problem for I discovered other connections too. In the duke’s house a table was being laid out for eighty friends of the present duke to commemorate the 200th anniversary of that famous battle with the most elegant tableware one could imagine. And on one wall was Josephine de Beauharnais herself, the only woman portrait among a sea of men. As the keeper pointed out amusingly the duke had made sure ‘not tonight’ was nicely surrounded by her admirers. But, I should add, Josephine had even greater loves – her roses. Around her palace of Malmaison, Jo created the world’s first rose garden with over 200 varieties by 1814. And that takes me nicely back to the rose garden the present duke can see from the back of his town house. A rosy day indeed! 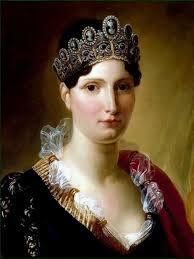 Josephine was evidently rather extravagant in her tastes. During her Emperor husband’s Egyptian campaign she bought a country mansion and when he returned he found their new “Maison” full of the most expensive furnishings and decorations. 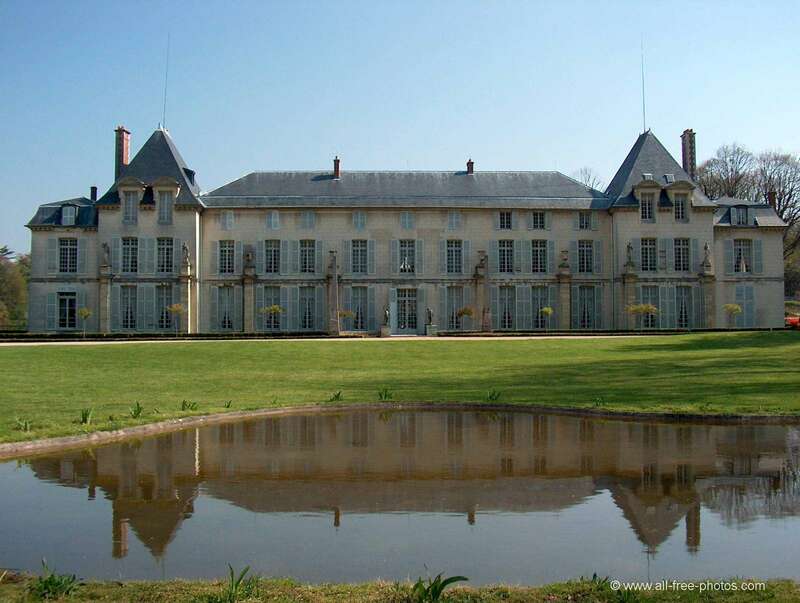 “Josephine”, he said, always wary of over-spending, you’ve turned our Maison into a “Mal Maison”. That’s one story of how Malmaison got its name. More accurately, the name derives from the fact that in the ninth century the place was a haunt of pirates. Napoleon, even after their divorce, would visit Josephine there and once remarked, “Josephine, what we’ve now got in common are our debts”. The ex-empress improved the house and garden constantly up to her death in 1814. This was where the emperor drafted his civil code, the basis of much of continental Europe’s law. In the garden Josephine planted over two hundred varieties of roses specially imported from Persia from which she made the first rose tea. On her death Josephine was buried in the local church. 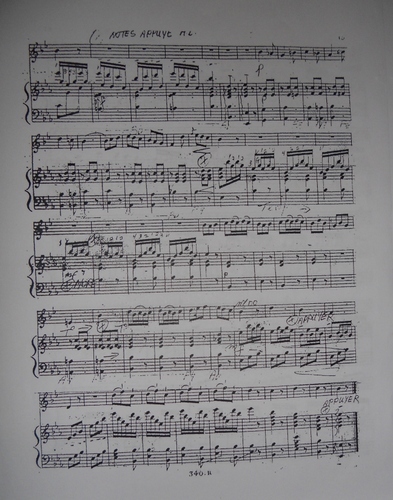 Not only did Josephine hold brilliant salons in the castle, she also commissioned elegant and virtuosistic music from some of the best composers of the time to provide a suitable background to her distinguished society. 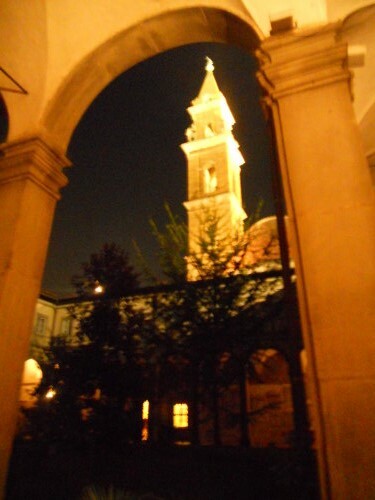 Some of these pieces we heard in a delightful concert given in the chapter house of Santo Spirito in Florence under the title “Serenades & Nocturnes at la Malmaison”. 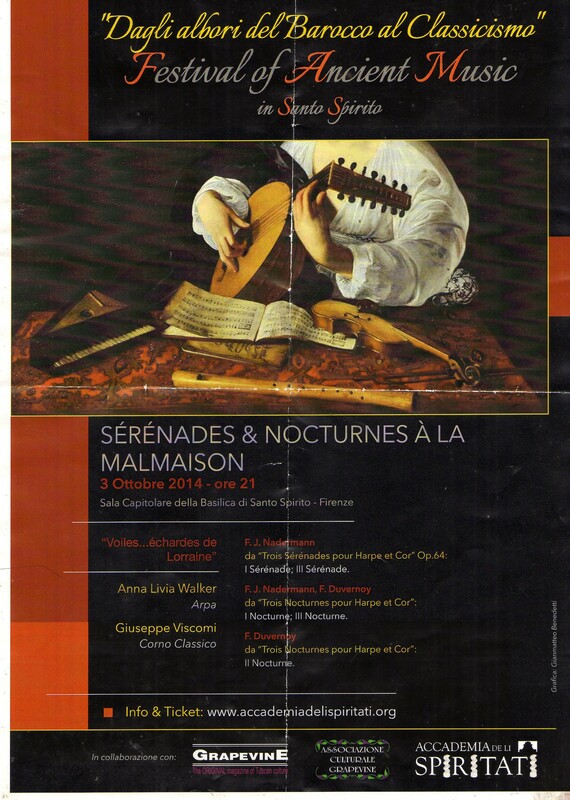 The performers were Anna Livia Walker, harp and Giuseppe Viscomi, natural horn. Francois Joseph Naderman (with one final “n” instead of two as the programme would have it) was the son of a famous 18th century harp maker, Jean Henri, and launched his career as harpist and composer under the French consulate. Frederic Nicholas Duvernoy was a horn player who also had his career propelled by Napoleon. Among his works are no less than twelve horn concerti, twenty duos for horn, a horn and harp sinfonia concertante and the nocturnes which we heard at the concert (and which had been published originally for horn and piano). While not plumbing the deepest emotions, the works the two brilliant performers played for us were highly engaging and entertaining – much more than wallpaper music, in fact. The horn is perhaps the most unreliable instrument in the orchestra – fluffs more often than not emanate from it, and as for the valveless natural horn! The wonder is that Viscomi played with utter élan as did Ms Walker, who steered her beautiful harp through the most complex figurations with complete security. I could not believe after the concert when Anna declared to me that she only got her hands (literally) on some of the music just a couple of days previously. I’d never heard this kind of repertoire before and was totally fascinated by it. As part of the ongoing Bon esprit event in Lucca we’d been introduced to life in the Napoleonic court, military campaign strategies, menus and even the emperor’s favourite animals (see my post at https://longoio2.wordpress.com/2014/08/19/napoleonic-dogs/. But we’d never savoured any of the music from Napoleon’s court. Finally our ears were treated to some of the emperor’s and Josephine’s favourite easy listening and were truly wetted for more of music which has never been heard since its debut at Malmaison in the early nineteenth century. Three rousing horn calls are surely due, therefore, to Walker and Visconti for bringing this dazzling but unknown repertoire to our attention.